In any fabricating operation, there is potential for myriad inefficiencies that hurt productivity. These include intellect, waiting, motion, transportation, inventory, defects, over-processing and over-production. Identifying where waste occurs can be challenging, but the press brake—often the bottleneck in many shops—is a good place to begin. Placing tool storage near the brakes decreases setup times. A press brake generates revenue when it bends material. Other actions relating to press-brake functionality, such as tooling setups, programming, material handling, sorting parts and reworking bends, do not contribute to profits. However, they can reduce waste, improve productivity and increase revenue through implementation of these five best practices. Shops should film setups and changeovers. This is a cost-effective method for identifying areas in the shop that can be improved. By simply using the video function on a smartphone, operators can identify areas of waste such as time spent looking for tools, tool storage location, operator movement between the brake and tool storage, and transport of the part blank and tools. Observing the cycle time between the first good part and last good part can help increase lean operations on the brake as well. Simply producing a good part is often the goal, regardless of the time and effort it takes. While that mindset can be an asset to quality, it can limit operational efficiencies. Weighing the value of the part when it arrives at the press brake against the waste generated to produce the bends proves critical for reducing waste and increasing efficiencies. Once the operators identify the special tools, setups and shimming, or other custom procedures required to make the bend, they then determine what to eliminate in order to complete the bend using just one setup and one part-handling action. Engineers can create standardized practices for offline programming while working with operators on the bend sequence. This collaboration can create visuals, such as setup sheets that travel with the production order, or graphic displays on the press-brake control to help reduce scrap and deliver setup efficiencies on the floor. Meanwhile, operators can analyze part flow and identify commonalities in a series of part runs, which result in fewer setups and greater productivity. Creating, sharing and storing programs for established best practices can help create fewer challenges with welding and assembly, adding even greater efficiencies to the entire production process. 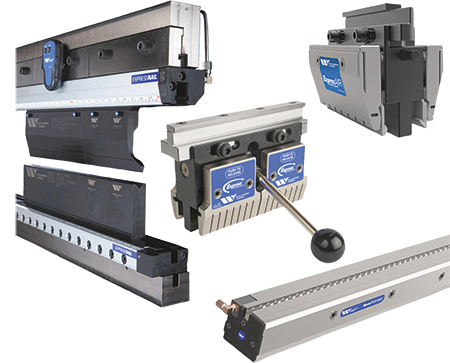 Clamping systems are designed to reduce manual setup time on the press brake. Organizing tools and tool storage can generate significant waste-reduction results. For example, a proactive step for achieving leaner practices is the implementation of a process to replace worn, damaged or missing tools. Another involves addressing how operators and tools move around the shop floor in order organize the workplace to achieve more efficient press-brake-operations. When operators have to walk several steps to look for and grab the right tools, and then have to walk back to the brake to perform a setup, time and labor are wasted and production costs increase. A simple solution: Place cabinets with the right tools near the corresponding press brake. Placing tool storage near the brakes decreases setup times. It also lessens worker frustration and fatigue. The same is true of clearly identified tools. Identify tools using color coding by machine or cell with paint and laser-marking tools for details such as material number, radius or V-die opening, length, and tonnage capacity. 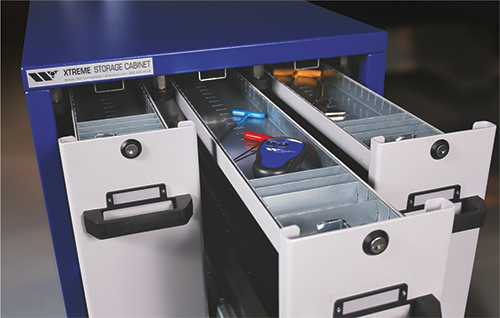 When identifying tools, label the outsides and insides of cabinets or tool racks. Finally, companies should look for changes that can improve operator ergonomics, such as building work-tables and part-support tables at the same height as the point of operation, and using a laser line for operators to better identify bend lines. These simple, low-cost solutions can significantly affect lean practices at the brake while increasing operator safety and comfort. As anybody in manufacturing understands, the desire to implement new procedures often comes with resistance. Fortunately, there are practices for implementing best-practice options on the press brake that will win over reluctant colleagues.